I need to close my Hotmail account. I'm getting too much spam, and besides, I think it's been hacked. I just want to close it and stop it from bothering anyone anymore. How do I do that? Closing your account will not stop spam that looks like it came from the account; hackers often fake the "From:" address whether or not the account exists. Closing your account will not stop your contacts from "being bothered"; if they had even brief access to your contact list, the spammers have probably already made a copy. Closing your account is not guaranteed to cause emails sent to it to bounce back to the sender; bounce messages are optional, and many services choose not to send them, to reduce spam. Closing your account may not even be possible if it's been hacked, and you don't have access to it yourself. All that being said, if you still want to close it, I'll walk you through the steps; it's not really that hard. I get questions that boil down to this symptom quite often. Unfortunately, it's very hard for me to offer concrete help. The problem is that there are so many possibilities that could lead to this symptom. There's simply no single "part of my computer" to point at. There are many things to look at, and look for, so I'll review the most common causes and remedies. Continue Reading: Why do I get a black screen on my computer after a while? While not specifically a technical term, the word ellipsis refers to the "three periods" that are often used to indicate that something is continued or hidden. In its simplest terms, an ellipsis simply means that "there is more". Quite literally, three periods in a row – such as "…" – comprise an ellipsis. Ellipses are used frequently when something to be displayed is too long for the space allocated. For example an ellipsis typically appears at the end of a menu bar that has more items than can be displayed. Clicking on the ellipsis then causes the rest to appear. Ellipses are also often used to indicate that something has been hidden, such as a signature or replied-to original in Gmail. In more general writing ellipsis simply indicates that there is more, that text is continued – either explicitly at some other location, or conceptually as in an unfinished expression of a thought. Robert Heinlein used TANSTAAFL - There Ain's No Such Thing As A Free Lunch. You pay for everything you do or use in some form. It can be obvious like paying for a phone connection or subtle like small ads on a web page. So Leo...after reading your article on nothing being truly FREE, what do YOU have to say about the Kubuntu operating system touted by a commenter? "no sane person who learns the operation methods for a Linux OS ever goes back to Microsoft" - that's just an unfair assessment. I do use Linux (I tend to prefer Mint). I also use Windows and Mac OS. Each has its strong and weak points. Many (many) applications are simply not available on Linux, and the free and open source alternatives are either non-existent, abandoned or unsupported from the perspective of the average user. Support, in general, tends to be difficult to find, and often exceptionally geeky - the point of intimidating the average user away. That being said, I recommend Linux to people all the time. When the needs are simple, or clearly the type of thing that Linux distros support well, then it absolutely can be the right solution for many people. It's just not the right solution for ALL people. Oh, and as for "I have never had a virus on my Linus OS." - that's fantastic, and I agree, Linux is a much smaller target for malware than either Windows or Mac. But once again, the only system I've ever personally had compromised was a Linux server. Never say never. You justify false advertising by the fact that it's common practice. Similar to my son justifying things with the excuse that, "....everybody does it', and somehow that's supposed to make it ok. It doesn't. One should not have to scrutinize the fine print to figure out that the download is free, but if you use it then you will have to pay. How dishonest and devious are you willing to justify? What you refer to as common practice I call a lie - plain and simple. Free means no charge. and free trial means you'll pay if you decide to keep it. Someone needs to look up what truth in advertising is all about. What you justify may be common practice, but it is certainly not truthful. As an truthful comment, I enjoy and appreciate your articles. Please understand I'm not trying to justify anything. I think it's as awful as the next person. My intent here is to educate. It is what it is - misleading or otherwise - and it's critical that people understand what FREE does, and does not, mean. 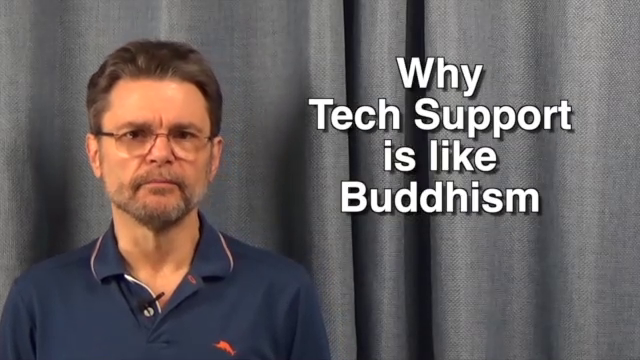 Because I absorbed over time a pretty good understanding of how computers work, and started helping friends solve their computer problems, I've wound up being the "tech support guy" for a dozen families. Each time I solve a problem, I try to tell them what caused it and how to fix it should it -- or thing like it -- happen again. Seldom works. Why? I've come to the conclusion that the "wiring" in people's brains is just different, and with many people, when it comes to computers, they are simply "learning disabled". The male partner in 3 of the families I support is a graduate engineer with many years of engineering experience. These are smart people. One is a chemical engineer and teaches chemical engineering. But when something goes wrong with their computers, they haven't a clue how to fix it, no matter how many times I show them what went wrong and how to fix it. I find they can't grasp the basics of the computer's modus operandi; that it has an "operating system" that is different from the "applications" they run; that the programs and files they create are stored on a hard drive and the hard drive is not "memory"; "memory" is something different; that you connect to the Internet with a "browser"; etc. I don't think it's possible to get around the "brain wiring" issue.